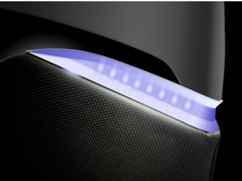  Evolved 3D massage Technology? 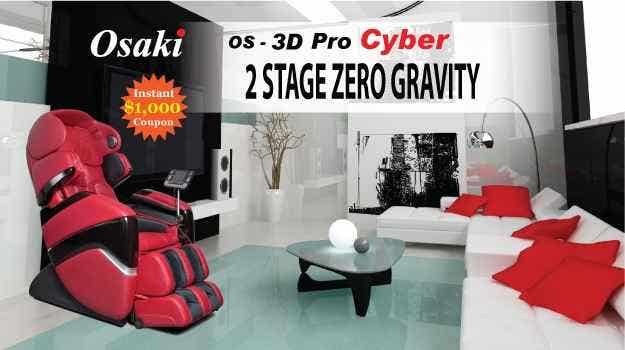  2 Stage Zero Gravity? 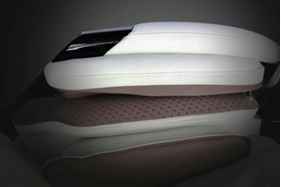 The next generation of 3D massage rollers is designed for outstanding range and flexibility. The 3D technology allows the user to control the length of rollers protruding out from the backrest. From the original start position, the massage heads can extend out up to 8 cm delivering a very deep tissue massage. 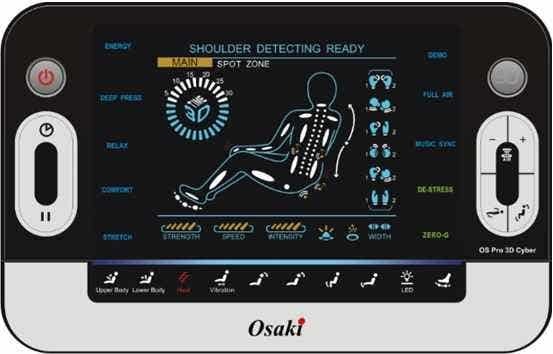 Osaki has re-engineered and has developed the next generation of air massage technology, streamlining the air massager to a lower count. 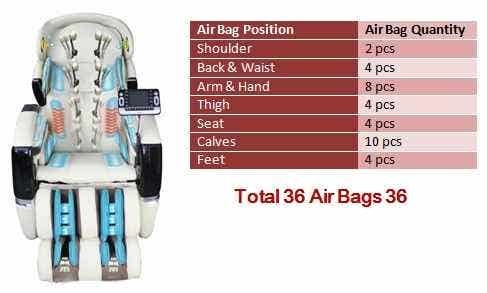 Through innovative engineering, we have reduced the total number of air bags but have increased the volume and surface area of massage. By doing so the total number of working valves has drastically reduced from prior model. Which ultimately puts less stress on the chair, making it one of the most mechanically sound massage chairs in the market. 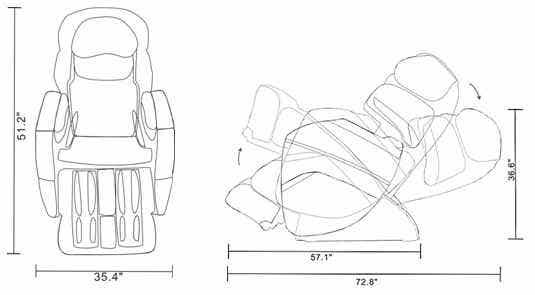 Along with mechanical advancement, the material has also made upgrades, such as the arm massaging area. Using a durable spandex , the bottom portion of the arm massager has been lined with small rubber bumps to invigorate the senses as the air bags compress the tops and bottom of the forearm and hands. You have approximately 350 accupoints in your body, with nearly 100 in your back and neck alone. Select one of six soothing massage types starting from, palm style, Swedish, combination, deep tissue, kneading, and shiatsu. 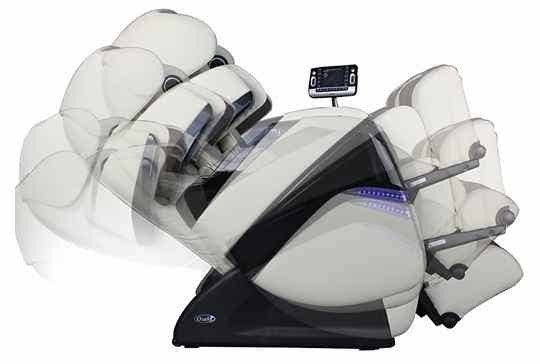 The OS-3D Pro Dreamer zero gravity massage chair has a variety of techniques to target the acupoints with incredible accuracy. The OS-3D Pro Cyber remote boasts one of the largest viewing screens (5") to easily visualize what functions the chair has activated. There is also a flip down cover to access the manual functions of the chair. The remote allows you to select the massage type, intensity, speed and location. You can also independently select the area of airbag massage . 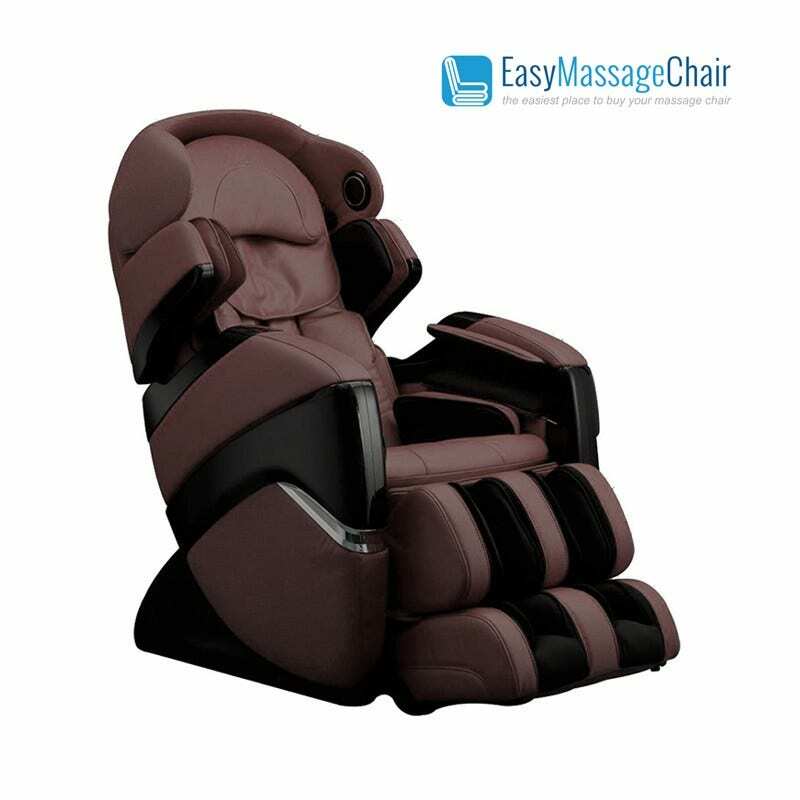 The manual mode massage includes kneading , tapping , shiatsu , rolling , combination and punching . 9 different pre-set massage programs - there are 10 pre-set massage programs to select from labeled energy, deep press, relax, comfort, stretch, demo, full air, music sync and de-stress, each unique from one another. Each preset program will go through all the variations of the massages but each one will focus on one style more than the other. 5 levels of intensity for the 3D massage - The roller heads that apply the massage to the back, can be extended outwards causing the rollers to press more firmly along the back. This will result in a more vigorous massage. Massage speed control - The speed in which the massage heads move can be controlled up to 5 different speeds , ranging from slow to fast. I admit I am not a purchaser, but I have used this same exact model at my workplace because patient's family have bought one and donated the chair after the patient's passing. I'm only a CNA, but I recommend this chair for any hospital/LTC/SNF/etc purely for how amazingly thorough it massages and circulates the muscles in a person's body. My stuff Alzheimer's residents really benefit from this chair; it moves the glutes up and down, rotates balls up and down the spine, does wonders on the lower back (I read a previous Q&A; did you know you're not supposed to feel pain during a massage? If you feel any pain in a particular area when relaxing your muscles, it means that area is where you are most tense and it's finally being worked at), firm but not too concentrated on the area. 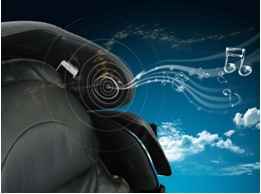 You can switch levels of intensity, vibrations underneath, heat on your lower back, and different reclines. I adore the air compressions on the feet, thighs, and wrist/hands because I do a lot of walking on concrete floors and don't treat myself to hand massages or anything; in my work, who has time? For patients who get too stiff when they decline in health, range of motion can only do so much, especially for dementia and Alzheimer's where mobility is taken. This deeply massages in the muscles and would be a great to anyone.